A £25.00 deposit is payable on confirmation of order. Payment by BACS is required at least 7 days prior to your event, plus a further	50% of the total amount to cover loss/damage. This is fully refundable on the	safe return of all the china. Payment in cash is accepted on the day of	collection/delivery. Delivery is free within a 10 mile radius of Pakenham, subject to a minimum	hire of £50.00. Delivery charges further afield are available on request. If you find you have to cancel your order, your deposit is non refundable. A cancellation with less than 7 days before your event will incur a charge of	50% of your total hire charge. Our beautiful china can include pieces that are up to 60, 70, or even more	years old and though we check every piece for damage, all china is used	entirely at the hirers risk. We kindly ask that china is returned clean (hand	wash only). However, if you have a busy schedule, we are happy to do the	cleaning for you at a cost of just 20% of your total hire charge. 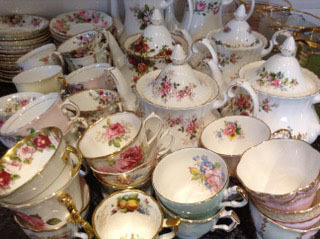 We kindly ask that damaged china is kept separately but still returned. Missing pieces will be charged at double the rate for damaged pieces.